The Achilles Tang is a unique and gorgeous tang! It does well in a tanks with a plenty of water movement with an adequate diet and good water quality. Unlike other tangs, the place in the ocean where the the Achilles Tang is found has lots of water turbulence. This tang thrives in this type of environment rather than a placid aquarium. This video shows an acceptable mix of several tangs with what sounds like pirate music, making it interesting to watch. While it cannot be determined what the tank size is, it does look large from front to back. The Achilles Tang appears to be the largest in the tank, and is sharing nicely with a Yellow Tang, Hippo Tang, Yellow Eye Kole Tang, and a juvenile angelfish that comes in toward the end. All of these tangs from different genus which makes it work. If you watch carefully you will see a snowflake eel appear around 1:11 in the background. Achilles Tang in a video tank. While you may first think this tang is in a tank that is too small for it, be assured this is a temporary visit for filming! The Achilles Tang, Acanthurus achilles, needs about 180 gallons, many places to hide, serious water flow, lots of food for their high energy swimming habits and good oxygen levels. My only experience in a 6' long tank was a fat, happy and healthy Achilles Tang.... until a 4 year old boy decided to slap the side of the tank really hard with both hands! My tang was dead that night, so I suppose a heart attack? These fish are prone to crypt (saltwater ich) and tend to share their white spotted disease freely with their tank mates, so a quarantine tank is essential for these fish. 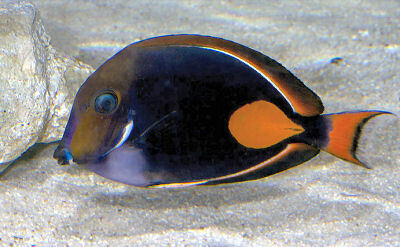 Achilles Tang are found throughout the Pacific ocean. The Achilles Tang is moderately difficult to keep. They seem to be more delicate than the yellow or blue tangs. Mainly found grazing on algae. Will accept brine shrimp, mysis, plankton, and krill. Usually found singly, they form territories in shallow water areas of the reef. In the aquarium the can get territorial especially if another tang is added to a tank with an already established tang. Found in areas with sunlight. Probably will not be accomplished in captivity. See the description in the Breeding Marine Fish page. No special requirements. Normal temperatures for marine fish is between 75 and 79 degrees. Achilles Tang adults can grow to 25 cm (10 inches). A minimum 75 gallon aquarium is recommended. Be prepared, this guy gets quite large! Swims all over the aquarium. This fish is generally readily available and is fairly expensive. I've an Achilles Tang I've had for about a month -- was doing fine but starting getting white spots about two weeks ago (thought it was itch), cleaner shrimp and cleaner wrasse seems to have cleared that up. However colouration seems to be lost on front half of fish and hasn't returned. Any ideas on what this could be -- not gasping for air, eating well and still moving well about the tank. Unfortunately didn't quarantine first (dumb I know) -- looking to take out of display tank to treat -- only have a goby and 5 year old Yellow Tang in the tank with him and they don't appear to be showing any signs (Yet). I have pictures if anyone want to see them if that might help. I have had them for months. I don't have any problems with the achilles, it's the blonde naso's I have issues with (typically giving up and refusing to eat after a short time). I have yet to meet anyone that has kept this fish for more than a week. And I know several who have tried. Achilles is still doing well, and has been transferred in to a new 300 gal tank. I attribute my success with this tang to chaotic water flow from both a oceans motions 8 way and a tunze wavebox. I also believe that having a rapid sump turnover rate is beneficial for keeping the water well oxygenated. I had a bout with ich with this tang, and instead of removing it, i kept up on water changes and feed selcon enriched or zoe enriched norri. infection was gone within a month. This tang is also kept with 3 other tangs, all of different genius: Blonde naso, bristletooth tominii, and A desjardini sailfin. My best tips for keeping this species are thus: Handle delicately, feed often, and most important of all, find a healthy fish from the get go.